For leading enlightened Western academics, Muslim modernists and ‘progressives’, he is considered the godfather of uncompromising violent Jihadism. For the modern day ‘Jihadi’, the life and works of Taqi-Uddin Ahmad ibn Taymiyyah (d. 728/1328) are regarded as sources of inspiration. Perhaps one of the most misunderstood and misquoted scholars, he and those claiming to follow his school of understanding today, have been accused of anthropomorphism, enmity towards people of spirituality or Tasawwuf, and creedal deviation from mainstream Sunni Islam. Ironically, Ibn Taymiyyah lived at a time very similar to ours, where Muslims in certain regions lived under non-Muslim rule, i.e. lands occupied by the Mongols and the Crusaders, and with various Muslim factions vying with one another to gain credibility with the Establishment. This intensive introductory course and BOOK LAUNCH will be delivered by one of the world’s leading experts on the subject. Polemics over anthropomorphism, Sufism, creedal deviation & fiqh. 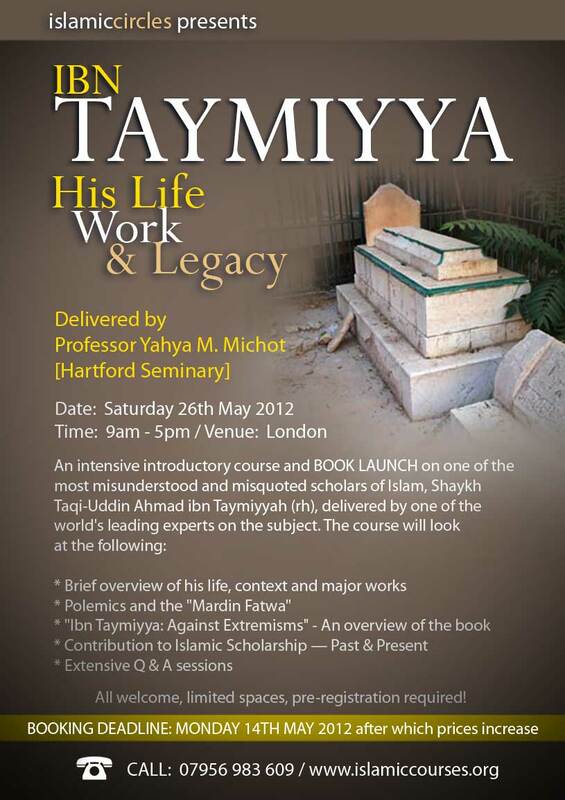 Professor Yahya M. Michot is one of the world’s leading experts on Ibn Taymiyyah. He was director of the Centre for Arabic Philosophy at University of Louvain in Belgium where he has delivered courses in Arabic, History of Arabic Philosophy, History of Muslim Peoples and Institutions of Islam, and Commentary on Arabic Philosophical Texts. His main field of research is the History of Muslim Thought with special reference to Avicenna (Ibn Sina), his predecessors and his impact on Sunni thought and Ibn Taymiyyah. Professors Michot’s interests also encompass the history of Muslim thought during the Mamlūk and Ilkhān periods, as well as modern Islamic movements. He has published numerous books and articles about Islamic classical thought, Muslim societies, including several volumes on Ibn Sina and Ibn Taymiyyah. Some of these articles include “La destine´e de l’homme selon Avicenne” (1986), “IBN SI^NA^. Lettre au vizir Abu^ Sa’d” (Arabic edition & translation, 2000), “AVICENNE. Re´futation de l’astrologie” (Arabic edition & translation, 2006) “Ibn Taymiyya: Muslims under non-Muslim Rule” (2006), “Ahmad al-Aqhisa^ri^: Against Smoking. An Ottoman Manifesto” (Arabic edition & translation, 2010), “Musulmans en Europe” (2002), and the chapter “Revelation” in the “Cambridge Companion to Classical Islamic Theology” (2008). 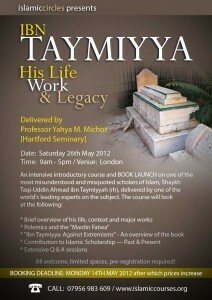 His next book, “Ibn Taymiyya: Against Extremisms. A Reader” (350 pages) will be launched at the course.